Reading manager Brian McDermott has revealed the club failed with a deadline-day bid for Tottenham midfielder Gylfi Sigurdsson. The Royals said they made a club-record bid on deadline day thought to be in the region of £10m with McDermott later confirming Sigurdsson as the player. But despite making three different bids they were turned down by Spurs. "We sat around last night, we tried to do a deal and we couldn't do it," McDermott told BBC Radio Berkshire. Sigurdsson would have been Reading's fifth signing of the January transfer window. Owner Anton Zingarevich had extended his stay in the country to try and secure the deal but ultimately the Berkshire-club failed in their attempts to bring back Sigurdsson. "It didn't happen," added McDermott. "We made three offers and you have to give credit to the owner because he tried to make that happen for us and we couldn't quite get it over the line. "We were all excited about the possibility of Gylfi coming back but unfortunately he is a Tottenham player and he is a good Tottenham player." The Iceland midfielder, 23, began his senior career at Reading between 2008-10 before leaving to join 1899 Hoffenheim. 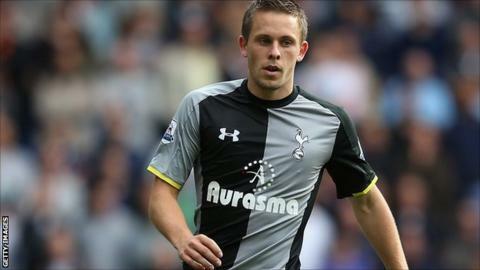 He signed for Spurs in 2012 after a highly-successful loan spell at Swansea. But he has struggled to make an impact at White Hart Lane this season starting just six league games. The Royals were keen to bring in a new attacking midfielder and failed with an offer for Blackpool's Tom Ince, while talks with Chelsea's Yossi Benayoun were unproductive. Speaking as the transfer window shut on 31 January, director of football Nick Hammond told the club's official website, "Myself, Brian and Anton have been working throughout the day on one last record deal to bring a player to the club but it hasn't come to fruition. "We've made four very good signings in this window and you can see that the players we've brought in have already made an impact."